« Stay Rad Wine Blog TV Episode 121: Stickybeak! 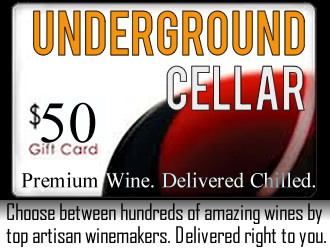 Just chiming in to give away $50 of free wine from Underground Cellar. Keeping It Underground. Keeping it Real. Over the last few weeks I’ve been keeping track of all the readers who entered the contest. This past Saturday morning I ran all of the names through an online randomizer, and I now have a winner. Congratulations, Frances. I’ll be sending you an email shortly with your coupon code, so you can start filling up your virtual cellar… or your literal stomach. It’s up to you. This entry was posted on October 28, 2013 at 6:04 pm and is filed under Wine. You can follow any responses to this entry through the RSS 2.0 feed. You can leave a response, or trackback from your own site.